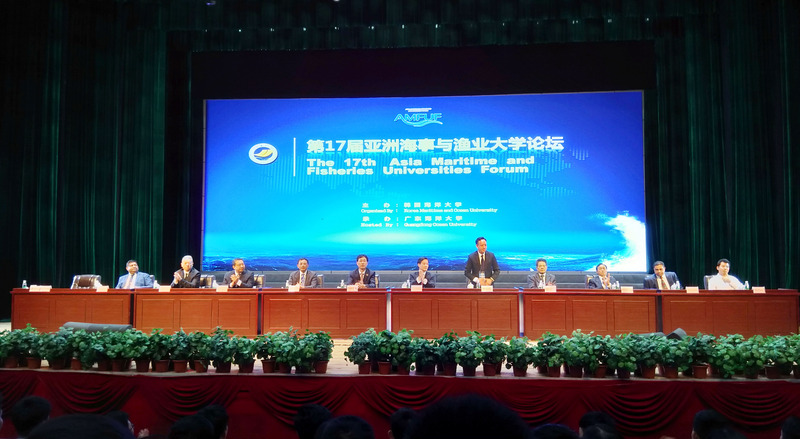 From Nov.15th to Nov.17th, 2018 Prof. Dr. Pham Xuan Duong, Acting President of Vietnam Maritime University attended The 17th Asia Maritime and Fisheries Universities Forum which organized by Korea Maritime and Ocean Maritime University (KMOU) in Guangdong Ocean University, China. AMFUF (Asia Maritime and Fisheries Universities Forum) was founded on 7th November 2002 at the Korea Maritime and Ocean University (KMOU) in Busan. It was the first permanent private organization in Asia, currently joined by 25 institutions including KMOU. The overall objective of this Forum, which is to be held annually, is to promote the academic exchange among the Asian Maritime & Fisheries Education Institutes and to further foster international cooperation on the education and research for the maritime & fisheries experts. The theme for the AMFUF 2018 is “New View on Marine and Fishery facing the Era of Intelligence”. Speaking in the forum, Prof. Dr. Pham Xuan Duong said: "In view of the development of education in the context of the Fourth Industrial Revolution, Vietnam's education has fundamental advantages to embrace opportunities brought about by this industrial revolution. We have always been appreciated in creating a positive learning environment, ensuring university discipline and helping students to have a good learning attitude. Besides, education administrators, and lecturers, who play a key role in education reform have received attention, investment and capacity building. Professional standards and norms of managers at all levels and teachers will be issued shortly. These standards and norms will be the tools to support managers and teachers’ capacity building to meet the requirements in the new phase." Specially, Vietnam Maritime University is very pleasure to host AMFUF 2019 to provide a platform for continuing of exchange information, ideas for future.